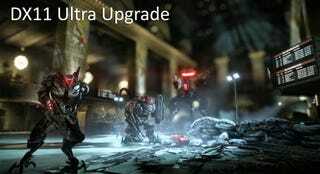 As predicted, Crysis 2's Ultra Upgrade hit today, giving PC gamers full DirectX support for the shooter. What's that mean? If your computer has the brawn you're going to get tessellation, water rendering improvements, high quality HDR motion blur, and higher quality texture formats. Starting Wednesday computer gamers will also be able to pick up the Map Editor Pack as well over on the official site. Looks like I'm going to have to reinstall Crysis 2 on my computer.